Thyme & Lavender - a beautiful combination of herbal and herbal/floral that you will love! 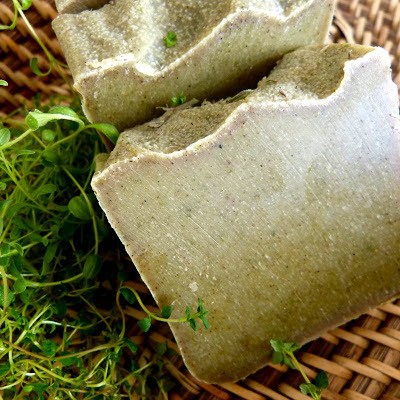 Made with all natural base oils, essential oils, and quality fragrance oils, Thyme & Lavender handcrafted vegan soap brings that same fragrance to your shower or bath. A deliciously fragrant and beautiful bar of soap with only the best ingredients. Many soaps are chemical heavy and harsh on your skin. Your skin deserves a kinder, gentler, natural bar of soap that will leave it feeling soft, silky, and moisturized. And it smells great! Each gorgeous and fragrant bar of 'Thyme & Lavender' comes wrapped in its own distinctive label with a list of ingredients on the back, and is enclosed in a clear cello bag, ready to give as a gift. This is the same soap as Olde Thyme Christmas, but with a Thyme & Lavender label. Thyme & Lavender is the perfect soap to keep in your shower, your bath, and be sure to get extras for guests. These beautiful bars also make much-appreciated gifts for Teacher, Mom, Sis, Grandma, Auntie, Piano Teacher, Best Friend, or simply 'Thinking of You.' A bar of HomemadeSoapNSuch natural vegan soap is something everyone will remember, for these beautiful, handcrafted bars last a long time when they're allowed to stay dry between uses. 100% Natural Base Oils, Vegan - we never use animal products in our soaps! Bars are approximately 4.5+ oz.